Galaxy Core Advance: Who is it for? At the end of the 2013, Samsung introduced Galaxy Core Advance, a smartphone with Dual-Core 1.2GHz processor and a large 4.7” display, adding another signature model to the Galaxy lineup. Each time Samsung adds another model, people might wonder how it is different from the other Galaxy smartphones. 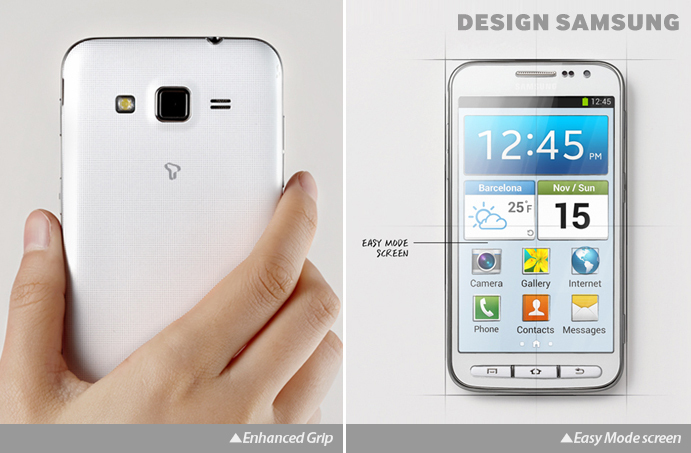 In Galaxy Core Advance, it was the usability, design and accessibility features that separated it from its predecessors. Long story short, the main philosophy behind the Galaxy Core Advance is ‘Convenient and Easy for Everyone’. Now, let us share with you how it stands behind its philosophy. To be accessible for everyone to use, Galaxy Core Advance was designed through Universal Design principles. Universal Design involves designing products and spaces that can be used by the widest range of people possible. By taking into account the full range of human diversity including physical, perceptual and cognitive abilities, products can be more functional and more user-friendly for everyone. Here are some key design features. The Galaxy Core Advance’s cover is coated with a vicious varnish to enhance the grip. And the soft-textured back panel design gives you a comfortable feeling. This also increases durability providing a warm, soft touch to the user and making it easier and more comfortable to grip. If you select Easy Mode, simple layouts and big icons will help you easily comprehend how to access what you want even if you are a first time user. Ergonomically designed buttons let you just ‘touch’ them in order to use the smartphone more easily and intuitively. Braille is included on the Power button and the Cancel and Menu buttons are designed as hard keys. Also, the most frequently used features such as Camera and Voice Recorder can be controlled by the buttons on the side of the smartphone. Galaxy Core Advance makes your daily lives more safe and convenient. 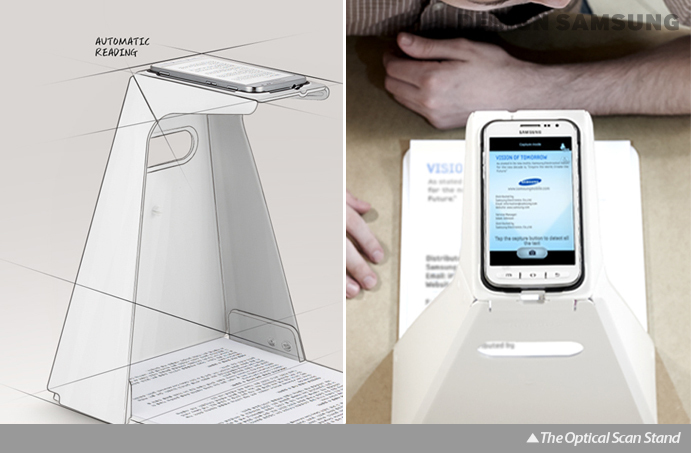 In order to design this model, visually impaired employees in Samsung participated in all stages of testing and more than two hundreds candidates took part in the usability test. The Ultrasonic Cover, it reads your surroundings using ultrasonic wave sensors and sends an alert of any obstacles within two meters, through a vibration or TTS (Text-to-Speech) feedback. And GPS with GLONASS (Global Navigation Satellite System) offers more accurate information on your location. If using the Light Sensing feature, the phone detects and informs the direction and brightness of light for you to notice whether the lights are on at home and to know the location of windows. The Optical Scan Stand automatically scans and reads documents and mails of A4 and US letterhead sizes, as soon as the paper is sensed on the stand. 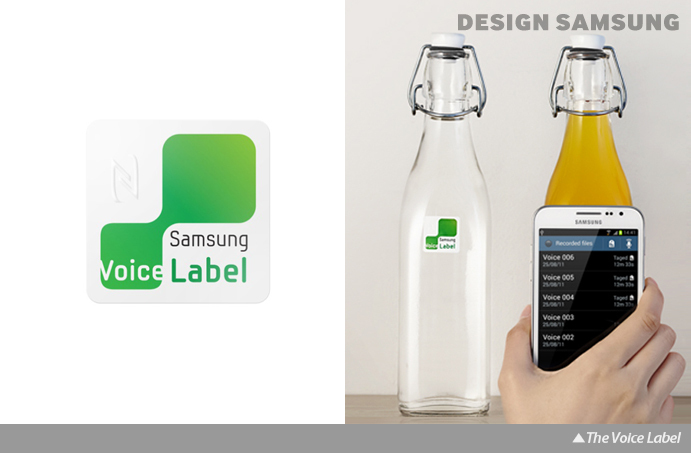 The Voice Label assists you in distinguishing similar products such as beverages, pills in similar bottles, or white and blue shirts. You register objects onto the Voice Label and it recognizes them and informs you about what the object is by using NFC (Near Field Communication) technology. *NFC (Near field communication) is a form of contactless communication between devices like smartphones or tablets. Contactless communication allows user to wave the smartphone over a NFC compatible device to send information without needing to touch the devices together or go through multiple steps setting up a connection. Equipped with Screen Curtain, Galaxy Core Advance enables you to operate commands on a black screen to ensure privacy. It also helps save battery life. You can share information such as YouTube videos, contact details and audio files with just a tap, using Bluetooth 4.0 and NFC with S Beam. When you take pictures, Voice Guided Camera will be useful by reading the number of faces detected and your standing location using High Quality TTS. Also, you can make a voice memo quickly by Instant Voice Recorder feature. Press the Voice Recorder button on the side and hold it for a few seconds, and you can directly access to the Voice Recorder. *Bluetooth 4.0: Bluetooth is wireless device-to-device technology enabling data exchange over short distances from fixed and mobile devices. Bluetooth 4.0 offers significantly lower power consumption than previous versions by enabling devices to remain paired, or connected to each other, without requiring a continual stream of data to be transferred between the devices. *S Beam enables you to transfer pictures, music, videos and files by placing two galaxy devices back-to-back. For more people to enjoy and benefit from the mobile experience, Samsung is trying to design and develop products that are more accessible and useful for everyone. To offer new possibilities in life for many people through experiential values, Samsung Electronics will continue its effort toward the design based on careful consideration for people. 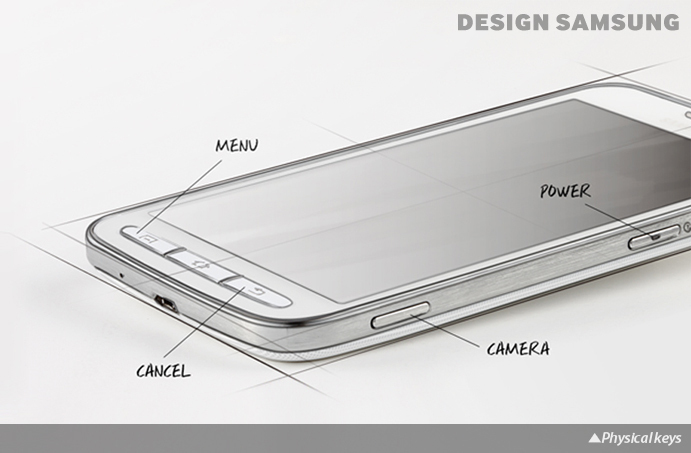 For more information about Samsung’s design story, feel free to check out Samsung design website.